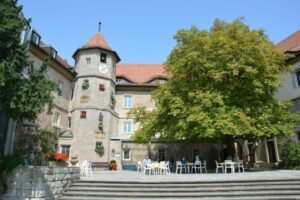 It sounds incredibly romantic: a medieval castle on top of a hill in Bavaria, and indeed it was beautiful. Here Nicolas and Jacob CR met with nearly sixty monks and nuns, brothers and sisters from all over Europe, to celebrate the religious life that we all share across our denominations. This International, Interconfessional Congress of Religious (CIR) brings together religious from Anglican, Roman Catholic, Protestant and Orthodox churches to pray for unity. The Congress met in a Benedictine convent of Lutheran sisters which grew up after the Second World War. Our four days were spent praying with the sisters of the Casteller Ring Community, enjoying each other’s company at meals and talking about the contribution the religious communities can make to the renewal of the churches in Europe. Conversation flows, or sometimes stumbles, in French, German and English. We also spent a day visiting nearby Würzburg, a beautiful city despite the destruction of most of its medieval buildings – some of the older sisters were there as youngsters when 90% of the town was bombed flat by Allied forces in 1945. Br Jacob gave a talk to the Congress on the importance of tradition in renewing our roots so that our churches will be confident and well resourced in this chaotic modern age. This was very well received and Jacob is now a member of the committee that will organise future congresses. Apart from the Unity we seek for our churches the Congress also helps to establish links of friendship and respect across the countries of Europe whose unity is threatened by the British decision to withdraw from the EU.